Using a custom-built camera the size of a refrigerator, Florida researchers have made the world's first crude pictures of X-rays streaming from a stroke of lightning. Seeing X-rays in relation to the lightning "leader," the initial spark and the channel it makes through the air, should help researchers build better models of the twisty and still unexplained ways that lightning behaves. The images are beyond blurry. They look like near-abstract blotches of white and green, better deciphered when displayed in a series with a rough sketch of the lightning tip superimposed. Dwyer took the pictures in July and August in collaboration with a team from the University of Florida at the International Center for Lightning Research and Testing. He turned 25 of them into video clip that shows 2.5 millionths of a second in the life of one lightning strike. It is a painstaking look at an elusive subject. We understand how a star explodes halfway across the universe better than we understand the lightning right above our heads, Dwyer said in an interview before his talk at the American Geophysical Union conference, a gathering of 18,000 scientists in specialties ranging from glaciers to volcanoes. The basics of lightning taught in grade school are correct as far as they go: a negative charge builds within a cloud and then is released downward, connecting with a positive charge. 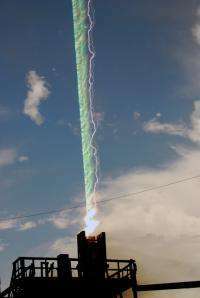 Once that connection is made, we see the lightning discharge, a glowing streak of the electrically altered, ionized air. Yet how that spark begins is still unknown. Electrical fields that have been measured in clouds seem too small account for it, Dwyer said. We also dont know what happens in the millionth of a second when lightning attaches to the ground, or why the lightning leader sometimes darts and sometimes, relatively, dawdles. Scientists have long speculated that lightning might produce X-rays, and in the past decade Dwyer has been one of the key researchers who helped confirm the presence of high energy photons. His group is among a handful worldwide that triggers lightning, generating it by shooting a rocket trailing copper wire up into a thunderstorm. This past summer the group made a series of pictures of four different lightning strikes, and recorded both X-rays and higher energy gamma rays along with them. It actually worked the very first time. It was unbelievable, Dwyer said. The hulking camera, towed on a trailer, relies on 30 radiation detectors pointed above the horizon and software written by Dwyer that turns its voltage measurements into images. Each detector contributes its bit of data to the picture, so the result is looks like a photo with only 30 pixels. Having even such low resolution pictures is a big step forward, Steven A. Cummer, a Duke University professor who was not involved in the work, said in an interview. Showing in the images exactly where the X-rays are coming from and when is significant, he said. While Dwyer's group has taken other measurements of X-rays in lightning, nothing replaces seeing it. "This is actually sort of what Superman would see," Dwyer said at a Tuesday morning press conference on his work. "Superman has X-ray vision." Eventually, Dwyer hopes to build a bigger machine with 150 detectors, but in the meantime and he and Meagan Schaal, who helped build the smaller version as part of her doctoral work, plan to improve its focus and take many more pictures this coming summer. Theres a whole zoo of different kinds of lightning that wed like to see, Dwyer said. There are dart leaders, which can hurtle at one-sixth the speed of light, and step leaders, which zip forward, hesitate for perhaps 10 microseconds, then zip again. There are chaotic leaders, which hesitate too but lack a regular pattern. And theres upward, positive lightning, which moves in the opposite direction of the most common, downward lightning strike. One of lightnings many mysteries is whether the X-rays are essentially just along for the ride, or actually play a role in its steps, darts and other dynamics. Its possible that the work might eventually lead to reducing the damage lightning can do, but thats not what sends Dwyer out to the testing site during hot summer thunderstorms. Isn't the whole point of a photo being able to see it? Wow ! They did it !! Something tells me this guy owns a red and blue jumpsuit.